1. How many Americans use technology for self-tracking? 2. 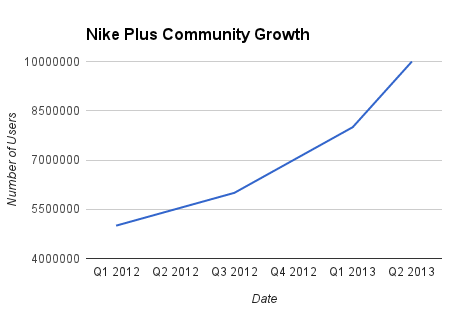 Is this number growing, shrinking, or staying the same? Should we conclude that the spread of health tracking is not even close to keeping up with technology adoption generally? 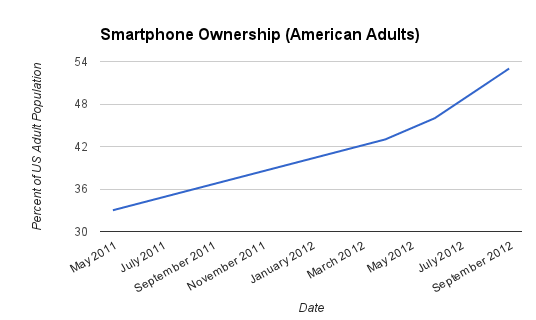 That, while smartphone usage grows, self-tracking stagnates? A recent fitness tracking report by Forrester makes a parallel argument. Sarah Rotman Epps, the report’s author, argues that the potential US market for fitness trackers totals a relatively tiny 8 million adults. We have high faith in the underlying integrity of the Pew Research, which comes from direct questions asked to a random sample of adults, and less faith in the Forrester numbers, which come from an online panel and some creative theorizing, but thinking critically about both of them has helped us advance our own ideas about what’s going on with self-tracking generally. Forrester’s research method was to ask an online panel if they were interested in buying a Fuelband, along with a series of lifestyle questions. They ran a regression to produce a profile of a likely Fuelband buyer, took this as a proxy for fitness wearables generally, used demographic data to calculate the number of potential buyers of all types of fitness wearables. To wit: 8 million. How does this claim look in light of the Pew numbers? If you look at current census estimates and the Pew data then we see that almost 35 million3 US adults are using technology to self-track. Of those, 8% use a medical device, like a glucose meter and 7% use an app or other tool on their mobile phone or device. Combined that comes to 5 million adults. And yet if we take Nike at it’s word, and we assume that Nike+ appls and devices fall into either the medical device or mobile app category, then the Nike+ ecosystem alone includes many more self-trackers than Pew found in their survey. Obviously these are partial views of a complex reality, based on very different types of data, but it would nice to have a theory that was compatible with all the evidence. To sum up: smartphone adoption is growing quickly; Nike+ participation is growing quickly, but the number of people using technology to track their health appears flat, and the total market for fitness tracking devices is tiny. We have some ideas about how to solve this mystery, but we’d like to hear what you think first. We’ll follow up with a post based on your comments and our own further thoughts. 1: In an email dialog we had with Susannah Fox she urged us to look at the full reports, especially the exact questions that were asked in the two surveys. You can check them here: 2011: The Social Life of Health Information and 2012: Tracking for Health. We’ll get into some details in our next post. 2: This data is available as part of the 2012 Tracking for Health report (pg. 18). 3: We calculated this by combing the Pew findings with the current estimates of the US adult population. More specifically we used the following calculation: (US adult population – 238,640,000) x (total trackers – 69%) x (technology trackers – 21%) = 34,578,936.